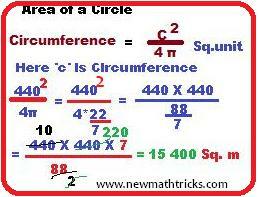 We have already covered mensuration formulas related to the circle. Especially, we discussed properties, circumference and area formula of the circle. Today, we are going to solve some problems in this chapter. This is the third mensuration tutorial on this topic. Look at below few questions and easy solution with the shortcut formulas. ►Question 1: A circle which has by 14m long radius. Now, find the area and circumference. Solution: This is the simple question from the mensuration. Directly, we can apply the circumference formula to find the answer. look at below for the easy solution. We know the circumference of a circle is 2 π r. Where π=22/7 and r is half of the diameter. So, simply apply the formula to find the correct answer. 2π r= 2* (22/7)*14 =88m. ►Question 2: The circumference of a circular park is 440m. Now find the area of the park? ►Easy solution: We knew in the circle mensuration formulas that the area can be calculated directly when the circumference is known. Look at below image for the shortcut formula and solution of this mensuration problem. ►Question 3: A circle has made by a rope. And it's radius was 28m long. If you made a square with that rope, how long will be an arm of the square? Solution: We have to calculate the area first. Then, we can calculate the length of the square. Look at below for the solution. Question 4: A Cricket playground has made by 63 m radius. 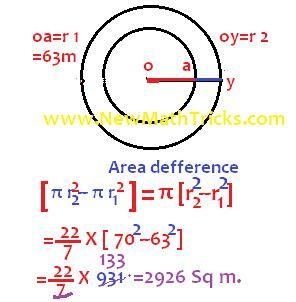 If the radius increased by 7m, then find the deference area. 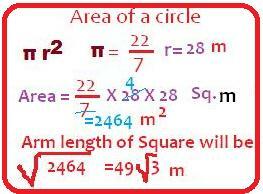 ►Solution: you can solve this mensuration problem by calculating two times the area of two circles. But you can answer this question by a single operation. But the question is how it's possible? Look at below for the shortcut mensuration formula for this type of question. Is not it easy mensuration friends? Keep visiting New Math Tricks for more question and aptitude formulas. You may check all Arithmetics math tricks or some solved math problems.